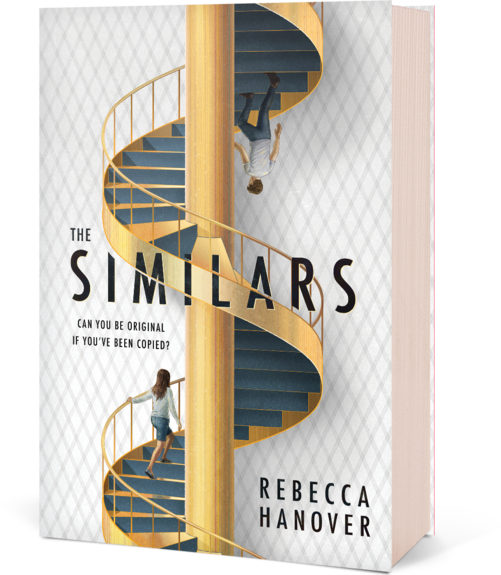 The Similars is a dystopian suspense that calls into question the things that make you you. This fall, six new students are joining the junior class at the elite Darkwood Academy. But they aren’t your regular over-achieving teens. They’re clones. And the “similar” teens are joining the class alongside their originals. The Similars are all anyone can talk about. Emmaline Chance couldn’t care less. Her best friend, Oliver, died over the summer and it’s all she can do to get through each day without him. Then she comes face-to-heartbreaking-face with Levi, Oliver’s exact DNA copy and one of the Similars. I found The Similars surprising in a number of ways. When it opens, Emma is so lost in her grief; you, as the reader, are immediately plunged into small, closed-off world. As the book progresses and Emma’s world expands, so, too, does your view. It’s an interesting experience that wouldn’t work if Rebecca Hanover’s writing weren’t as strong as it is. Too much more of Emma’s early apathetic tendencies would be off-putting, but Hanover has found the right balance. The idea of putting two genetically identical people who were nurtured in different ways together is compelling. It raises the question of nature vs. nurture. Of course, identical twins share the same genetic code, but in almost all cases, they are raised together and have similar traits — my own sisters-in-law even created their own language. I love books that make me think beyond the story, and this aspect of The Similars did just that. Of course, there’s more to The Similars than just the Similars. The mystery of how they came to be and how more than one person is subtly — or not so subtly — pulling the strings in the background makes for an intense storyline that ends primed for a sequel.